A few days ago, a reader emailed wondering why “all of a sudden there have been stories in the MSM about Obama losing support among Jewish voters, presumably due to insufficient support of Israel. That’s odd, because he’s been solidly pro-Israel.” In my reply, I mentioned a recent poll showing that Obama had lost a lot of Jewish support, but beyond that I brushed it off as just another movement conservative attack line. Obama is weak, Obama wants to raise your taxes, Obama doesn’t understand business, Obama hates Israel, etc. etc. It’s a useful attack, and it’s one that conservatives make about liberals all the time. Obama’s just the latest victim. 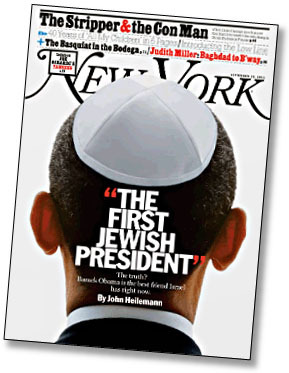 On a substantive level, Obama has had Israel’s back over and over and over since he took office. Heilemann provides chapter and verse in his piece. But for conservatives, this isn’t enough. They flatly reject the idea that the United States should ever pressure Israel over anything. The fact that Obama did so was more than enough to confirm their belief that he’s anti-Israel at heart. Of course, as Heilemann and many others have pointed out, Obama’s approach is almost certainly in Israel’s best interest. One way or another, Israel has to make peace with the Palestinians. They can’t absorb the West Bank, since that would make Israel majority Arab within a few years, nor can they occupy it forever. There was at least a chance that Obama’s approach could have cut through this Gordian knot. But Benjamin Netanyahu wasn’t willing to consider any settlement slowdown of any sort, and the Israeli public has endorsed his hardnosed attitude by keeping him in power. So we’re stuck, as usual. And, really, there’s no reason for Netanyahu to budge. He apparently doesn’t accept the necessity of making peace anytime soon, and he knows perfectly well he can treat Obama any way he wants and pay no price for it. His public harangue of Obama in May, which should have made any American cringe regardless of partisan affiliation, was proof enough of that. It was a loathsome performance on a bunch of different levels, but it brought cheers from Republicans and nothing but nervously averted gazes from Democrats. So why should he change his tune?